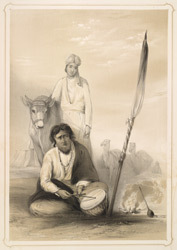 This lithograph was taken from plate 17 of Emily Eden's 'Portraits of the Princes and People of India'. Fakirs are wandering mendicants or holy men in India. Eden wrote: "Large Indian Camps have a fakeer attached to each, who sits with his staff stuck in the ground, and beating a drum, by the road-side, near the encamping grounds, to which he points out the path, with loud cries of prayer for each passer-by. His office is a welcome one, at the conclusion of a tedious, and often hot, morning's march; and he is generally rewarded when all the marches of a journey are over, by the contents of a subscription purse, raised among the members of the camp."